How many times have you seen a headline that seems ridiculous? And then how many times have you passed that story along on Facebook or Twitter? Don’t feel guilty. It can be difficult to tell the difference between fake and real. Here are four tips on quickly making that differentiation. Check the URL. The web address, or URL (Uniform Resource Locator), indicates the origin of the article. 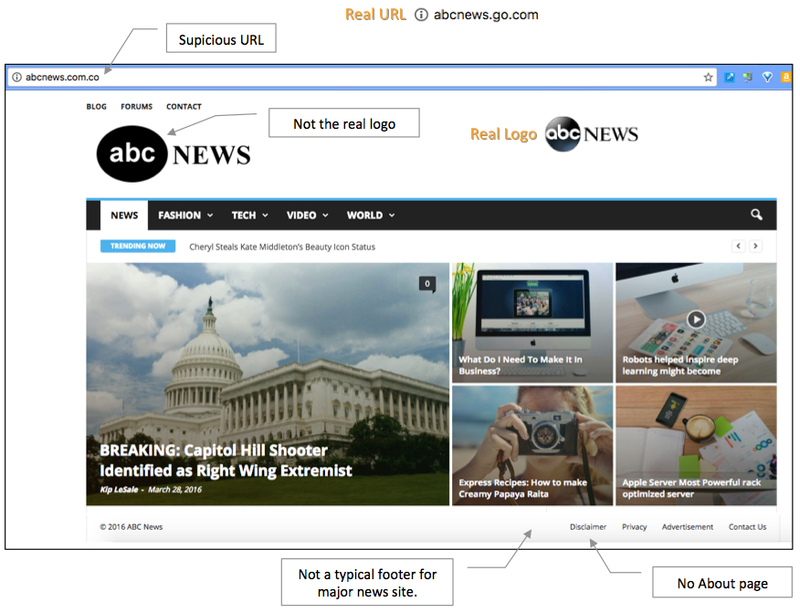 In the graphic below, the URL is suspicious because it ends with “.com.co” rather than the expected “.com”. The ABC News site has been around for a long time, so it most certainly would have a dot-com domain (the letters after the last dot), not dot-com-co. So pay this site no mind. Check the logo and overall look of the site. Does the logo look real? Does the site look professionally developed, like the majority of major news sites you visit? If not, treat the page with great skepticism. Look at the footer. Is there a fairly distinct, definitive footer? Or is the footer just one line with fairly vague titles? For instance, the footer in the graphic below looks scant and not what you might expect from a major news organization. The real ABC News website’s footer is shown at the bottom. Look for an About page. If you don’t find one, chances are good that the site is suspicious and should be avoided.